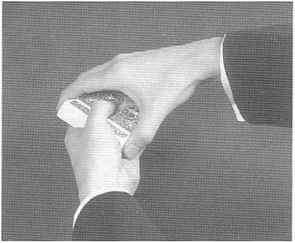 The following is my method of performing Harry Blackstone's favorite card trick. Harry used a special deck. 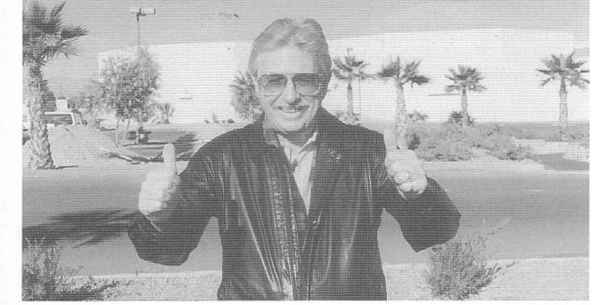 Larry Jennings' impromptu method is very well explained in his wonderful book "The Cardwright," pp. 1 through 4.
form the "Turn Around Glimpse," spotting the top and bottom cards. 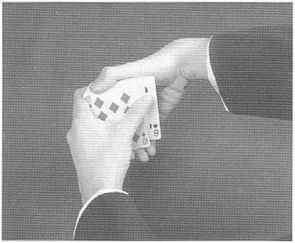 If, after performing the Turn Around Glimpse, the top and bottom cards are too low, simply cut the deck and perform the glimpse again. Let's say that, after the glimpse, the top and bottom cards are an Eight, and a Ten. Added together they total eighteen. Subtract one from your total and you get seventeen. Remember this number as vour kev. The right hand rotates the pack clockwise and the left fingers regrasp the pack. Glimpse the top and bottom cards as the left thumb pushes the top card flush writh die pack. (See Photo 2) You want to get two fairly high cards, but a high card and a low card will do as well. I count the Jack as eleven, Queen as twelve and King as thirteen. 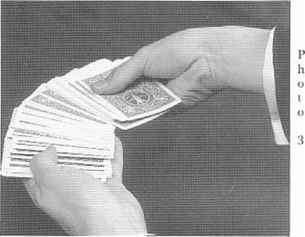 Slowly spread the cards from your left hand to your right. Count the cards in groups of two's and three's until you reach your key number, in this case seventeen. As I begin the spread 1 say, "Notice all the cards are face down!" This remark enables me to be deliberate in my spread as I am counting the cards. When the card has been selected, have the spectator show it to everyone present. 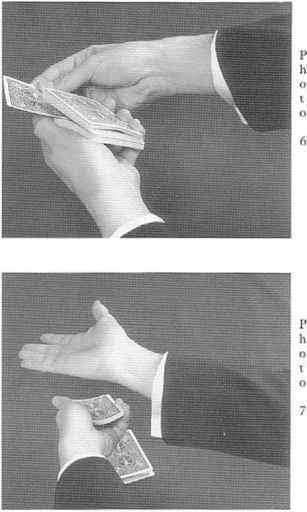 During this time, you perform the following: close the spread of cards into a left hand dealer's grip. The injogged card will stay in place. Bring the right hand over the pack, fingers in front and right thumb in back. 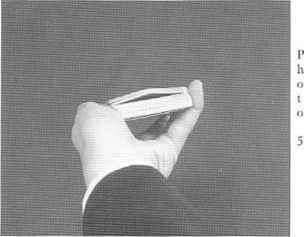 Cut under the jogged card, and place this packet of seventeen cards to the bottom of the pack, and regain a break with your left little finger over this packet. Immediately cut the bridged packet back to the top and release all breaks. Looking at the pack from the rear the bridged packet should look like Photo 5. 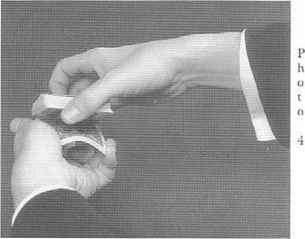 Holding the pack in left hand dealer's grip, take back the selection in your right hand, keeping the card face down. With your left thumb run down die outer left corner of die pack. 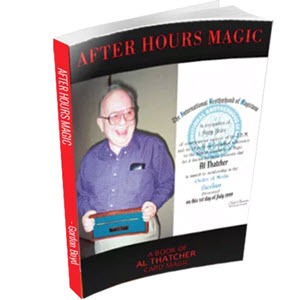 When you have passed the bridged cards, ask the spectator to stop you at any time. Stop the moment the spectator tells you to. Insert the face down selection into the break formed by the left thumb. (See Photo 6) With your right hand above the pack, fingers in front and thumb in back, push the selection in at an angle so that the right lower corner of the selection protrudes from the right inner corner of the pack. With your left little finger pull down on the jogged corner, push it flush and form a break. With your right hand cut the bridged packet to the table to the left. This is packet # 1. Cut a second packet of cards up to the break and place them on the table to the right of the first packet. This is packet # 2. Cut 1/2 of the remaining cards to the table to the right of packet # 2. This is packet # 3. Place the remaining packet in your hand to the table to the right of packet # 3. This is packet # 4. Place # 1 onto # 3 and # 2 onto # 4. Then place # 1 and # 3 onto # 2 and # 4. The deck is now assembled with the original top and bottom cards in place and the selection below the correct amount of bridged cards. Pick up the pack in your hands and say, "It's quite easy to find the location of your card. All I have to do is add the values of the top and bottom cards together, and the total will tell us how far down in the pack your card is!" it in a more interesting way. I will cut off exactly seventeen cards and the eighteenth card will be yours!" Hand the packet to the spectator and let him count the cards. He will count seventeen cards. Pause and have him turn over the top card of the pack, the eighteenth card, which will be his selection. This routine has been a pet of mine for over twenty years.